When you’ve just had your worst Fantasy Premier League Gameweek of the season, the temptation is to go for broke. Tom Hickey decided to do just that. 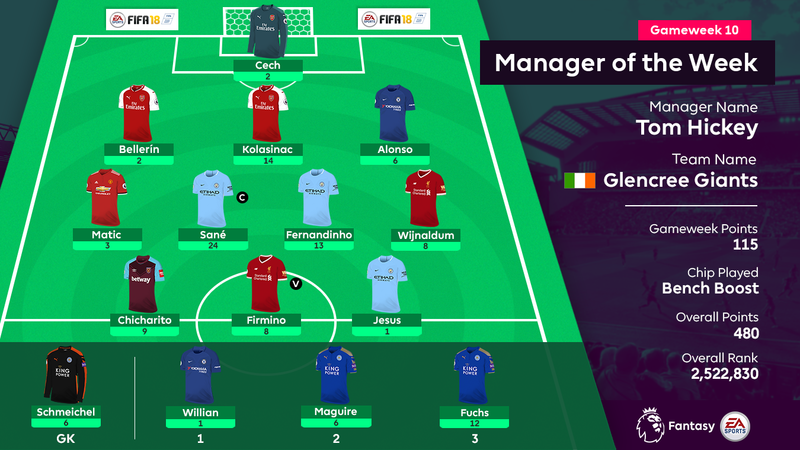 Having suffered a Gameweek rank of 5,058,455 in the world, the Irish manager turned to his Bench Boost chip for a change in fortunes in Gameweek 10. He backed Leicester City for Claude Puel’s first match in charge, bringing three of their back five into play. It proved a masterstroke as the Foxes ran out 2-0 winners over Everton. Goalkeeper Kasper Schmeichel (£5.0m), along with defenders Harry Maguire (£5.1m) and Christian Fuchs (£4.9m), combined to earn Tom 24 points from his bench. But he didn’t just rely on the chip for a big score – his three most recent transfers also proved inspired signings. Fernandinho (£5.1m) was drafted in for Gameweek 9 and, a week on, delivered his season-high 13-point total in Manchester City’s win at West Bromwich Albion. Chicharito (£6.9m) also joined Tom’s team at that point and, like the Brazilian, produced the goods a week later. The striker scored just his second goal in eight outings in West Ham United’s 2-2 draw with Crystal Palace. But the capture of Georginio Wijnaldum (£6.7m) was perhaps a bigger revelation. Liverpool’s midfielder had missed the previous fixture through injury and yet Tom looked to the Dutchman as his replacement for Juan Mata (£7.0m). Wijnaldum returned to contribute his first goal of the campaign in Liverpool’s 3-0 win over Huddersfield Town. Meanwhile, Leroy Sane (£8.7m) proved a worthy captain. He brought in another 24 points via Man City’s win at The Hawthorns, boosting Tom’s total to an unbeatable 115 points. From placing outside of the top five million in the world in Gameweek 9, Tom was the No 1 manager a week later. He climbed almost 1.6 million places to rank 2,522,830 overall. With the foresight to back a Leicester revival and a trio of shrewd transfer moves, Tom truly deserved the latest Manager of the Week accolade. He claims a copy of FIFA 18, a Nike Ordem V match ball and an FPL mug, all bagged up in an FPL rucksack.